"This petition is now closed." Once again The College of Veterinarians of British Columbia seeks to prohibit veterinarians from performing cosmetic cropping of ears for all dogs within B.C., supporting the Canadian Veterinary Medical Association’s (CVMA) position on the ear cropping of dogs. This by-law change would interfere with the right where veterinarian and client work together for the betterment of the dog. In order for this by-law change to take place one must study the colleges role and list of Duties. Located in their by-laws under Duties and objectives it clearly states in “section 3. (1) In carrying out its objects, the college must, (a) protect the public interest, and (b) exercise its powers and discharge its responsibilities under this Act in the public interest.” This by-law is going against the public interest (1). A by-law that would prohibit a Veterinarian from performing Ear Cropping is an abusive use of power that is not going unnoticed. CBC’s airing of Barking Mad (2) looked into the CVMA’s role not so long ago, uncovering that the unnecessary testing and the over vaccinating of our pets is also established by our CVMA, forcing our provincial Veterinarian Associations to follow the guidelines in order to operate without, prejudice whether they believe in them or not. (3). Another example of the Canadian Veterinarian Medical Association's mandates was the removal of all teachings of tail docking. Thus, young veterinarians who wished to be educated on this procedure were deprived of this option in the early 1980's. Following this CVMA recommendation Veterinary Medical Associations soon removed the practice from their college curriculums. This without notification to the public or its future colleges. Ear cropping has been self-taught amongst the Veterinary field. One might challenge that the only motivation for some veterinarians who wish to discontinue this procedure is that they are usually unable to perform it successfully and that aftercare is considered onerous and therefore financially unprofitable. It also appears that the CVMA wants to dictate policy, what the veterinarian can and cannot do, which may be politically driven. If the Veterinary schools were allowed to open the doors and have docking and cropping taught, many of our historical purebred breeds would be saved and preserved for our future generations. I’m sure that if the choice was presented without facing ridicule or banishment, a skilled Veterinarian would volunteer as a qualified instructor. Ear cropping is a simple procedure, and only takes 30 minutes. Do the surgery in the morning and puppy is sent home in the afternoon. When properly performed, there is no more pain than a spay or neuter. In fact, the ear leather at eight weeks is so fine they hardly even realize it's been done; healing time is minimal with lifetime benefits. Ear cropping is far from being an unnecessary procedure especially carried out in cases of injury or for medical reasons. Some dog owners and their veterinarians emphasize that ear cropping provides the dog a benefit by reducing ear infections while improving the hearing. However, there is no scientific evidence to support this claim other than the knowledge and opinions from some our reputable Veterinarians who have great success with ear cropping (4) and the hundreds of thousands of cropped eared pets living today. There also is no evidence that supports the claims of having detrimental effects, if this were true than there would be countless reports on dogs suffering as a result of ear cropping being performed, animal rights would be jumping all over this. So with little or no scientific evidence to support either side's claim, one would have to look at the animals that have these surgeries performed, and the knowledge of a Veterinarian that has performed these surgeries as well as the owners and breeders that care for them. 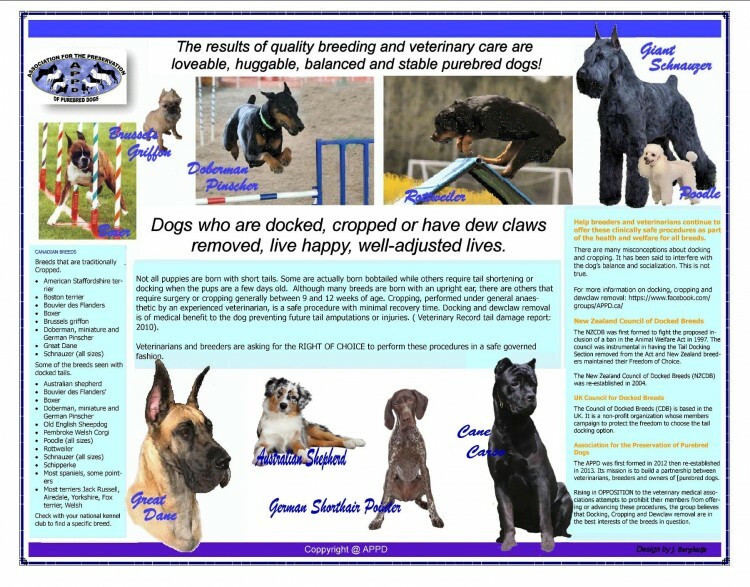 Research shows that countries that have prohibited ear cropping such as those in Europe, and Australia and New Zealand are not only struggling to save certain breeds (5) but have also have been able to find a loop hole in their kennel club's by-laws to allow Cropped and Docked dogs to compete once again in their show rings, only proving that the prohibition on docking and cropping was not what was best for certain breeds. (6) . WE NEED TO CHANGE things so that the Veterinarian and future Veterinarians have the right to be trained/continue to practice these beneficial elective surgeries. We, the undersigned, support ear cropping and tail docking, it not only should remain legal but returned/added to the curriculums of our Veterinarian colleges. We can’t allow politics to take precedence over the health and well-being of our Purebred dogs. The Ear cropping and tail docking should remain legal, and once again be returned to the curriculums of our Veterinarian colleges petition to College of Veterinarians of British Columbia was written by Association for the Preservation of Purebred Dogs and is in the category Animal Welfare at GoPetition.